Here is the Gospel of John, the "beloved disciple." Colin G. Kruse explains how the Gospel of John alone speaks of the Logos who was with the Father in the beginning, who came down from heaven, incarnate in the person of Jesus. In this respect John is unlike any of the other Gospels. In John, Jesus' message is presented mainly in terms of eternal life and resurrection and his teaching is frequently presented in long conversations, discourses and debates. Outstanding in this Gospel is the extensive teaching about the Holy Spirit. For all these distinctives, a study of John is not to be missed. 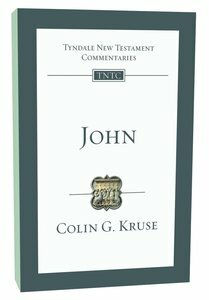 About "John (Re-Formatted) (Tyndale New Testament Commentary Re-issued/revised Series)"
Dr Colin Kruse is lecturer in New Testament at the Bible College of Victoria. He came to BCV after 16 years at Ridley College. He has authored several books including New Testament Models for Ministry: Jesus and Paul (Marshall, Morgan and Scott); The Second Epistle of Paul to the Corinthians (Tyndale New Testament Commentary Series; IVP/Eerdmans); Paul, the Law and Justification (IVP/Hendrickson), and commentaries on The Letters of John (Pillar New Testament Commentary series; IVP/Eerdmans) and The Gospel according to John (Tyndale New Testament Commentary Series; IVP/Eerdmans), and Paul's Letter To The Romans (Pillar New Testament Commentary series; IVP/Eerdmans). The apostle Paul's correspondence with the church at Thessalonica provides a valuable glimpse into issues confronting the community. Was Paul merely exploiting them for money? What about those members who had already died? Would they receive Christ's blessings when he came again? As Leon Morris deploys his characteristic knowledge and wisdom in interpreting these two letters, he not only illuminates their original meaning and context but also shows how they bear on the church today. Peter's short letter to the 'exiles of the Dispersion' addresses many topics: holiness, the sufferings of Christ, suffering as a Christian, God's sovereignty in salvation and life, the grace of God, the work of the Holy Spirit, the church as the new people of God, the reality of the unseen spiritual world, and trusting in God in the midst of daily circumstances. It is suffering, Wayne Grudem suggests, that ties these seemingly disparate themes together, particularly suffering as a form of imitating Christ, who, by bearing our sins on the cross, gives meaning and comfort to Christians in all aspects of their daily lives.